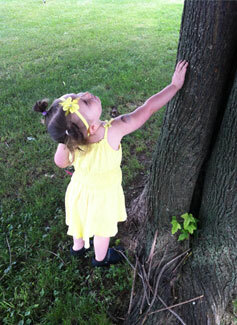 Chemung Valley Audubon Society is committed to the education of everyone in our community. We want all of our members, their friends, their family members, and every one we meet to be active participants in promoting our mission and protecting our birds. One way we ensure our success is through FREE, fun, family-friendly programming. 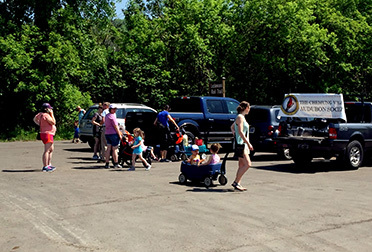 Nature Strollers is our fun, free outdoor program for babies, toddlers, and young school children and their caregivers, that we do from late May thru early December. This program excels at developing school readiness skills, creating an awareness of the world around us, and providing the visual stimulation necessary for children to further develop the farsightedness needed for school success. 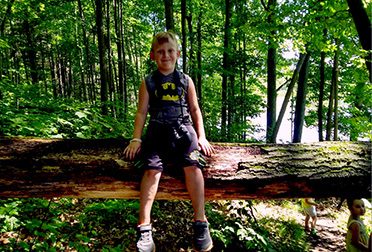 One of our expert nature guides leads you and your children on a leisurely walk through locations around Chemung County and encourages children and their families to interact with and enjoy our natural world. Literature related to the theme of the walk is provided, as well as binoculars. Snacks and drinks are provided for the children halfway through the one-hour walk. This program cancels for thunder and lightning, but we love to walk any other time, including in the rain! Please visit our calendar for exact meeting locations or changes to our Nature Strollers program. We've received so many positive reviews from parents, and many report that our program has inspired their children to learn more about wildlife and spend more time outside. It's a great way for you and your children to experience new places and get new experiences in familiar places in our area! The 2019 schedule is now available for download. 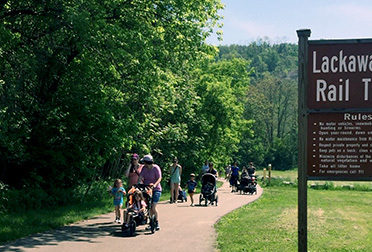 This year, Tanglewood Nature Center, River Friends, and CVAS have teamed up to provide our local families with these fun, family-friendly walks. Every quarter, we host a series of public lectures featuring experts and engaging speakers on topics relevant to our mission, including conservation efforts, bird and wildlife identification, and more. Lectures are generally held one Thursday each month at seven in the evening, and are free and open to members and non-members. Dr. Warren Allmon, Director of the Paleontological Research Institute, who shared with our group an enlightening and thoughtful presentation that posed the question, "Can the study of ancient life help us understand climate change?" Bill Ostrander and Gail Norwood, who gave an insightful presentation on identifying migrating raptors. Jillian Liner, the Director of Bird Conservation for Audubon, NY, who discussed her work with New York's Important Bird Areas (IBA) program. Ithaca-based photographer Sarah Blodgett, who discussed her journey into wildlife photography and shared her stunning photos of the natural world. Rick Marsi, who gave a thought-provoking program about how Southern Tier flora and fauna constantly adapt to changes in climate, land use, and conservation practices. Biologist John Confer, professor emeritus at Ithaca College, who described his work with saw-whet owls at his owl-banding station east of Ithaca. These seldom-seen owls are common in North American forests, the smallest owl species of our region, with a catlike face and bright yellow eyes. Chemung Valley Audubon Society hosted the 69th Annual Meeting of the New York State Ornithological Association (NYSOA) September 9-11, 2016. 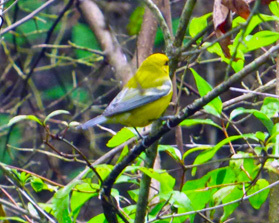 Birding opportunities along the Chemung River, which flows through the heart of Elmira, were just steps away from the weekend’s headquarters at the Holiday Inn-Elmira Riverview. 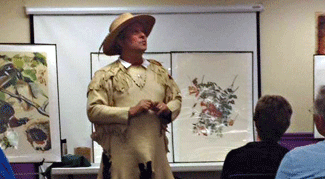 Historic reenactor Brian “Fox” Ellis twice treated his audience to skillful performances in the role of John James Audubon. 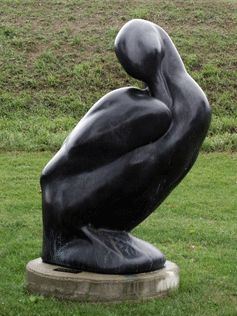 He led a Friday afternoon river walk to an oversized bronze rendering of the extinct Labrador Duck (photo at right), one of the Lost Bird Project series by sculptor Todd McGrain. The bird is memorialized at Brand Park in Elmira, where the last known individual was shot on December 12, 1878, by a boy in search of wild game for the family table. Ellis once again took on the role of Audubon, as the early American artist and ornithologist, during the Friday evening buffet, interweaving historical events and people with his bird stories. The guest speaker at the Saturday evening banquet, Dr. Rob Bierregaard, who is a research associate of the Academy of Natural Sciences of Drexel University, presented “Tracking Ospreys in the Age of Silicon: Migration, Ecology, Conservation.” Since 2000, he has fitted satellite transmitters on 52 juvenile and 43 adult Ospreys. He shared his discoveries about the dispersal and migration of juveniles as well as the hunting behavior of adult males feeding their families. Field trips, the papers session, and of course, the delegates’ meeting filled out the weekend. Birders tallied 122 species, taking with them memorable checklists and a network of new friends. The conference committee included Chemung Valley Audubon Society members Marty Borko, Brian and Mary Jane Dugan, Bill Ostrander (Chairman), Mary Anne Perks, and Linda and George Slobodnyak, all of whom worked diligently to plan and oversee the details of the weekend. Our thanks go to all of the volunteers and participants who contributed to the success of the conference. We look forward to the 70th annual meeting in Fall 2017, hosted by the Buffalo Ornithological Society! NestWatch is a nationwide monitoring program of the Cornell Lab of Ornithology in which volunteers find and monitor bird nests. The data we submit allows for more accurate reporting of the status of breeding birds. 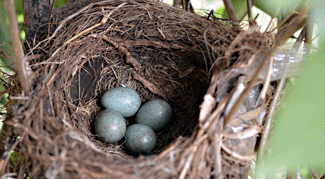 To learn more about NestWatch, click here. 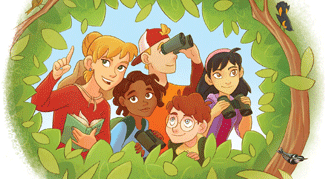 BirdSleuth is a lively program for school-aged children that teaches key concepts, including diversity, adaptations, food webs, and more, through hands-on learning. When you visit the BirdSleuth web site, you’ll find resources to help you teach at home and in the classroom, including webinars, a guidebook, a curriculum, and more. 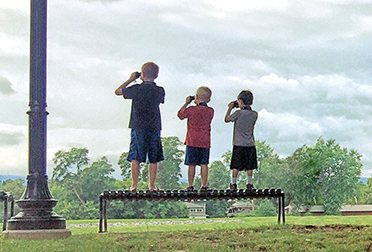 Developed by Cornell Lab of Ornithology in 2004, it encourages kids to spend time in the outdoors, focusing on the sights, sounds, and behaviors of birds; to answer their own questions about nature by using the scientific process; and to engage in data collection through citizen science. 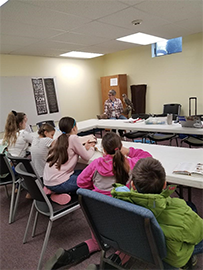 During the 2016 - 2017 school year, CVAS volunteers met two Fridays a month with 35 home-schooled students in grades 1-12 in their group “TGIF” gathering, using the BirdSleuth curriculum to bring the world of birds to their classrooms. The students began with the basics: setting up a bird-feeding station, understanding field marks, using binoculars, and identifying and counting birds for Project FeederWatch. They learned about food webs, ecologists, and scientific inquiry. Midway through the year we offered a family field trip to the Johnson Center for Birds and Biodiversity in Ithaca, NY. The Center houses the world-famous Cornell Lab of Ornithology, Museum of Vertebrates, Bioacoustics Lab, and Macaulay Library of Natural Sounds. Our behind-the-scenes tour guide shared stories about the history, people, and collections of the century-old institution. We saw a Sandhill Crane specimen that would soon become part of the bird-skins collection, a 26-foot-long python skeleton from the 19th century, a listening buoy that detects right whale sounds in Cape Cod Bay in real time (and thus alerts ships to steer clear), and much more. The huge viewing windows in the visitor center, the walls full of beautiful bird art, and a trail walk at the end of the tour reinforced among the families the desire for a return visit. 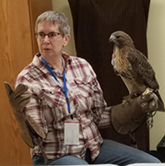 The students concluded their two-semester BirdSleuth adventure with two big events: a May family field trip to Bluebird Trail Farm in rural Steuben County, NY, and the “Avian Expo,” their own science fair devoted to birds. 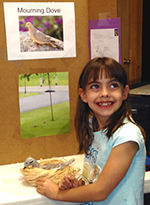 The BirdSleuth “Avian Expo” showcased independent projects, with an emphasis on fun and creativity. Investigations included tool use by crows, suet/seed feeding preferences, and favorite birds (Blue Jay, Scrub Jay, Peregrine Falcon, Bald Eagle, Mourning Dove, Gray Catbird, Black-capped Chickadee, Ruby-throated Hummingbird, Tufted Titmouse, Wood Duck, Rock Pigeon, Red-tailed Hawk, Northern Cardinal). Students proudly shared what they learned with friends and family who toured the expo, including facts about Blue Jays and Peregrine Falcons, pictured at right and below. Pictured at left, a second-grader proudly displays her hand-sculpted and painted Mourning Dove in a nest. At the farm, we hiked a mile-long trail through a wildflower meadow, enjoying Eastern Bluebirds and Tree Swallows nesting in boxes along the way. We spotted Bobolinks in the tall grass and learned that they fly all the way from Argentina to raise their young in North America’s meadows, logging 12,500 round-trip miles annually. At the trail’s end, we played the Migration Game. Acting as migrating birds, we learned to avoid dangers such as tall buildings, reflective windows, outdoor cats, and windmills. Our morning concluded with the chance to pet and feed young farm animals. Who can resist a bunny? The students’ capacity to assimilate what they had learned about birds and focus on their independent projects shone through at the Avian Expo on our final class day. From studies of favorite birds to questions of scientific interest, students exhibited their work using posters, videos, art, poetry, written accounts, and oral presentations. Our thanks go to parents for their enthusiasm and field trip participation and to the TGIF homeschool program for hosting BirdSleuth. Thank you to guest teachers Monika Wood and Mary Anne Perks for your gifts that make learning fun. And thank you to the CVAS board of directors and members for funding the BirdSleuth program. Most importantly, our thanks go to the students, whose natural curiosity about the world—now and throughout their lives—lies at the heart of caring for our planet. We encourage you to make a donation to Chemung Valley Audubon Society to support this and other educational programs that we offer in the Southern Finger Lakes region. The CVAS book club meets on Thursdays. For meeting information and a list of the books we'll be reading, please click here. The Audubon Council of New York State had their Spring meeting at Saratoga Springs from March 22 - 24, 2019. You can download a summary of the report here.